As I noted in my previous post, I've been interested in the ways GoogleEarth can be used to link with biblical sites. Over at OpenBible.info (specifically, go to: HERE), a GoogleEarth file linked to every location in the Bible has been created. It is really a great resource. If you don't want to download/install GoogleEarth (but why wouldn't you? ), there are also preview links grouped by biblical books to GoogleMaps online. The only thing that needs more work is that all the Jerusalem sites are given a single coordinate. The Google Maps are of high enough resolution that those locations could be split up. Each location is also linked to its biblical reference, and that reference is a clickable link to the ESV Bible site. So, you have the option of searching either by biblical book or by specific place or by clicking around on the map. I also want to highlight another GoogleEarth mashup provided by HERE at the GoogleEarth Community board. 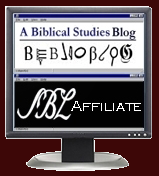 It provides a similar collection of links to biblical sites, but instead of linking to the biblical references, brief descriptions are provided. I've also been playing around with GoogleEarth overlays. If you go HERE, you will find some overlays of ancient trade routes I've created. I encourage you to grab all these links!